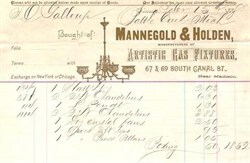 Beautifully engraved billhead from the Mannegold & Holden Artistic Gas Fixture issued in 1888. This historic document has a vignette of a light fixture. This item is over 112 years old.